Posted on January 27, 2018 Posted in Marshmallows	. 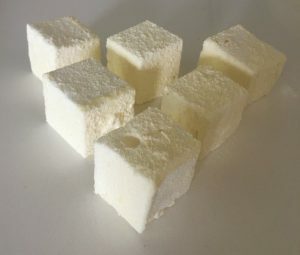 I recently posted a recipe for Moscato Lemon Marshmallows, where I mentioned in the post that there were 2 marshmallow flavour combos that I really liked with varying methods where I opted for the recipe that provided the fluffier product. 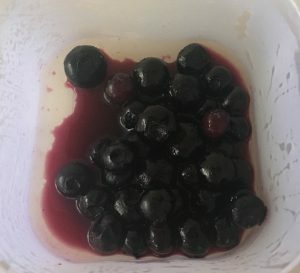 As the flavour combo of the less optimal method of blueberry, lavender and lemon was so tasty I decided to use the Moscato recipe as the base to redo the blueberry version. I did need to play around a bit with volumes and ratios, as Moscato’s liquid is much thinner than mashed up blueberries. After experimenting accordingly I reached the point where I was quite satisfied the texture of the marshmallows was just as good as the Moscato version. The blueberry, lavender and lemon work really well together, the lavender is not overwhelming and is balanced well by the berries as they have the same flavour profile. Whilst the lemon complements both the berry and lavender, pushing the flavour up a notch. Line a 10cm x 10cm slice tin with baking paper. 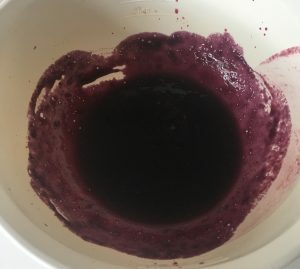 Heat the blueberries in a bowl in the microwave until thawed and steaming. 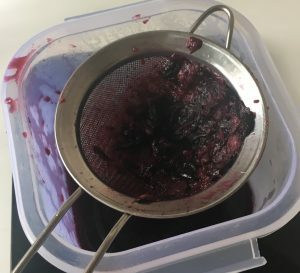 Squash the blueberries through a sieve to get 200ml juice. Pour 120ml of the juice and the vanilla essence into a saucepan on a low/medium heat until the mix is simmering. Add the gelatin to the saucepan and whisk with a hand whisk until the gelatin is dissolved, set aside. 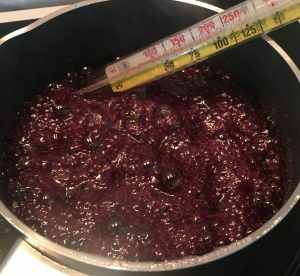 In another saucepan add the remaining 80ml blueberry juice, the sugar, glucose, ground lavender and lemon zest and stir on a high heat until the sugar is dissolved. 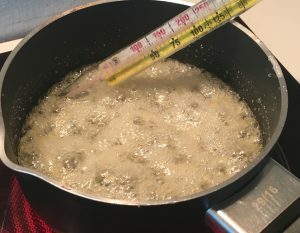 Place a candy thermometer into the saucepan and allow to cook until 128c degrees is hit, following take the pan off the heat. Meanwhile, place the egg whites and salt into a bowl and whisk with electric beaters until soft peaks form. 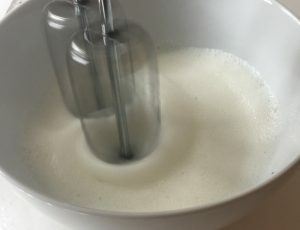 Pour the sugar syrup into the egg whites in a slow stream while whisking the egg mix on high with the electric beaters until all the syrup is combine. Next add the gelatin mix slowly, whisking with the electric beaters until the egg mix is cooled. Pour the mix into the lined tin and place in the fridge for 4 hours+ (overnight if possible) to set. 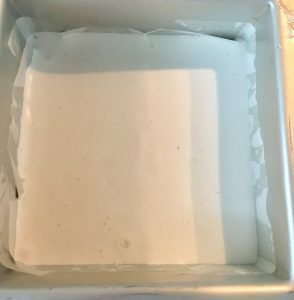 Remove the marshmallow out of the tin, and on a cutting board pull the baking paper away from the sides of the marshmallow. 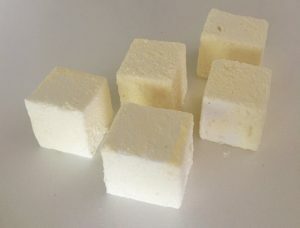 Spray a knife with oil spray to stop the marshmallow sticking and cut the marshmallow into squares. Place a piece of baking paper onto the bench, sieve the icing sugar and corn flour into a bowl then sieve over the piece of baking paper to cover. 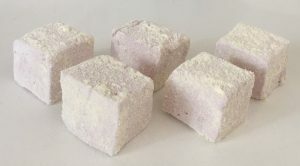 Place the marshmallow onto the icing sugar mix and roll each piece until they are all completely covered on all sides. Tags: Blueberry, Blueberry Lavender and Lemon Marshmallows, lavender, lemon, marshmallows	. Posted on December 2, 2017 Posted in Marshmallows	. After realising that I have baked a bit with marshmallow (for homemade fondant, as a pie filling ingredient and as decoration) I have never actually made marshmallow from scratch. 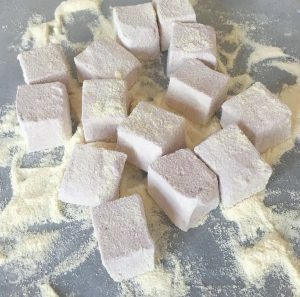 I am always up for, and love to experiment with new techniques and sweet treat variations, therefore, homemade marshmallow to me is an exciting way to spend an afternoon. Traditional vanilla or raspberry marshmallows that you find I the supermarket to me are quite boring so I started to do some research on some interesting and new to me flavor combos. After playing around with some variations there were 2 combos that I just couldn’t decide on as being my favorite. Thus, I decided to make both flavors but with 2 varying methods (one using egg whites and one without). Though both were successful the recipe that incorporated egg whites was much more fluffier and massively exceeded my expectations. 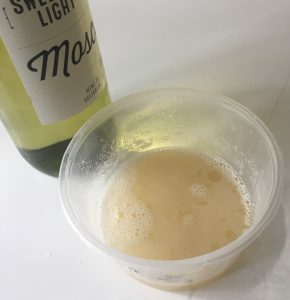 Below is the delicious Lemon and Moscato flavor pairing with the fluffier recipe . Line a 20cm x 10cm slice tin with baking paper. Pour 120ml Moscato and the vanilla essence into a saucepan and heat on a low/medium heat until the mix is simmering. 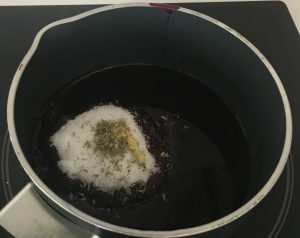 In another saucepan add the remaining 80ml Moscato, the sugar, glucose and lemon zest and stir on a high heat until the sugar is dissolved. Place a candy thermometer into the saucepan and allow to cook until 128c degrees is hit. 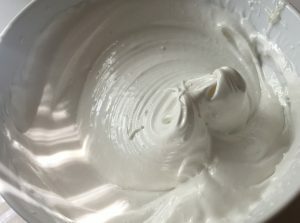 Meanwhile place the egg whites and salt into a bowl and whisk with electric beaters until soft peaks form. 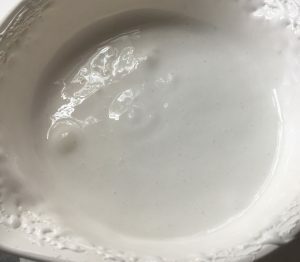 Pour the sugar syrup into the egg whites in a slow steady stream while whisking on high with the electric beaters until all the syrup is combine. Next add the gelatin mix slowly, whisking with the electric beaters until the mix is cooled (this will take quite a few minutes). Pour the mix into the prepared tin and place in the fridge for 4 hours+ (overnight if possible). 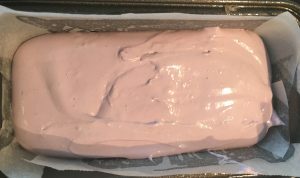 Remove the marshmallow out of the tin and place onto a cutting board, pull the baking paper away from the sides of the marshmallow. Next spray a knife with oil spray to stop the marshmallow sticking and cut the marshmallow into squares. Place the marshmallow pieces onto the icing sugar mix and roll each piece until they are all completely covered on all sides. Tags: lemon, marshmallows, Moscato, Moscato and Lemon Marshmallows, Moscato wine	.